This simple onion Focaccia bread is Umbria’s best flat bread. A crispy and light yeasted crust is topped with tender onions and flavored with olive oil and sage. I have always been one for slow things. My husband makes fun of me because when he tells me a joke I laugh 5 minutes later. Years ago I have embraced the Slow Travel movement. It was 2003 and we had just opened our B&B. I discovered this group of Italy lovers who wanted to convince the world that sipping a cappuccino on a terrace overlooking some rolling hills was better than sitting in a crammed bus herded towards the 10th museum stop of the day. Eccentrics. Of course I do a lot of slow cooking. This does not necessarily mean that all my food needs 3 hours to be ready. Actually most of my recipes are ready in 10 to 30 minutes, but I do love to simmer sauces over very low heat, with a lid on, so flavor does not evaporate while boiling. Feels slow even if it is fast. Recently I have discovered slow-raising dough. Characteristically, I have been slow at discovering it. The whole world has been making Lahey’s no knead bread or Hertzberg’s artisan bread for years. Those lovely golden crusts and airy crumbs are obtained with minimal amounts of yeast and a wet dough. The result is a less acidic, lighter and more digestible product. I wanted it for my pizza , I made a few experiments, I figured it. Happy. The dough recipe above is the exact copy of my pizza recipe but uses 1/4 of the original amount of yeast. The recipe has been divided in two steps which are implemented in two subsequent days. Day 1. Sprinkle the yeast over the water. Let it stand 1 minute, or until the yeast is creamy. Stir until the yeast dissolves. In a food processor, combine flour, olive oil and salt. Mix briefly. Add the yeast mixture and mix at maximum speed until a soft dough forms. Alternatively mix ingredients by hand in a large bowl, then turn the dough out onto a lightly floured surface and knead briefly until smooth and elastic. Depending on the gluten content of the flour you use, you might need up to 1/2 cup more water than what stated in the recipe list. You need to make the dough as wet as possible but still firm enough to obtain a soft ball. Transfer the dough into an oiled bowl and cover with plastic wrap. Place it in a draft free area of your kitchen, covered by a tea towel. Day 2. In a covered pan, slowly soften the onion slices in a couple of tablespoon of evo oil until translucent. Do not caramelize or they will burn in the oven. For the focaccia in the photo above I have used red onion, but you can use any color or even mix different varieties for effect. Preheat the oven at maximum temperature. 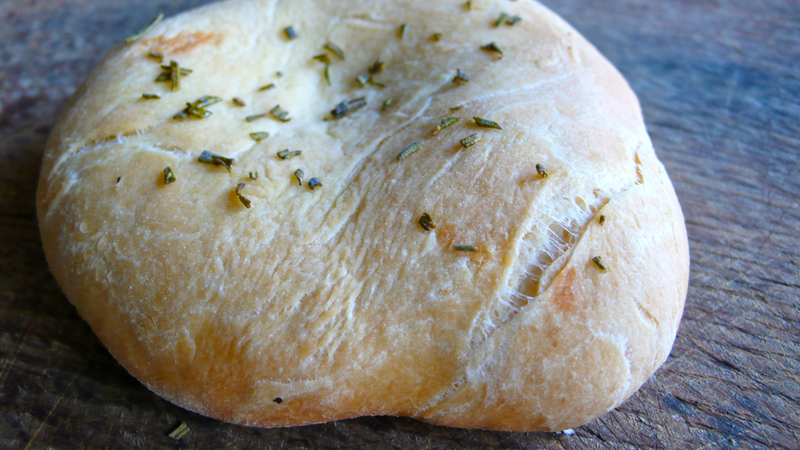 Allow enough time for the oven to stay at maximum temperature for at least 15 min before cooking the focaccia. About one hour before dinner, transfer the dough into an oiled pizza pan and stretch it with the tips of your fingers into a 1/2 inch thick pie. I generally lightly coat the pan with ½ olive oil and ½ sunflower oil. Again, place the pan in a draft-free place, cover with a tea towel and let it rise an additional 1/2 an hour. Distribute the mozzarella, onions and chopped sage leaves over the focaccia dough. Drizzle with 1-2 tablespoons evo oil , season with salt and freshly ground black pepper and bake until golden below and around the sides, 8 to 12 minutes. The cooking time will vary depending on your oven, the hotter the better. For my daughter, who likes everything plain, I make mini focacce (pizzette) sprinkled with olive oil, rosemary and salt. Once cooked, I freeze them in individual bags so they are handy to bring to school for a mid morning snack. Let me just say that I saw the picture at the top, drooled and came straight here to comment….! Giselle sweetie, I wish I would have a slice for you right now. I promise I will have plenty on Wednesday! the advantage of this recipe is that I have made it over and over again and it always work. I have just reduced the amount of yeast and took extra care to have a really soft dough. My no-knead-bread was also not a huge success because with the original recipe I get a batter, not a dough. I think this depends on differences within types of flour available in different areas of the world. Plus it resembles bread that I can easily buy here so less worth the effort for me. I am definitely going to have to try this. It looks so wonderful! thank you, let me know if it works well, I love it too! I made the dough yesterday. It was delicious but I found that I needed a little more olive oil and/or water to get it moist enough to mix sufficiently in the food processor – I pulsed off and on for about 3 minutes so as not to overheat the dough. Thank you! Thank you Michael, I am glad you have tried it. I have experienced different flours absorb different amounts of moisture, so one has to adapt recipes to local ingredients. I’d sat to add more water rather than more oil. Miss Letizia, I have decided that this is the first bread that will come from my newly ordered food processor. I have purchased a new cuisinart 14 cup, that was highly rated by at least 6 websites. I love to make bread by hand, but time is so precious that I prefer a food processor(especially after watching you make the best pasta dough this way)!! oh, the Pane degli dei, the simple focaccia, I have tasted it in so many forms, but this recipe, so simple, and unified in taste, is what I desire. I will let you know how it comes out, if my fingers are not to slippery to touch the correct keys!!! lovely Jeff, I am sure it will work out well. It might take a few experiments as not all flours absorb the same amount of water. I find that artisan flours (e.g. stone ground) take more moisture. The more hydrated is the dough the lighter and airy the focaccia will be. However too much water and the pizza will be a little thin. I don’t mind that as the flavor is always delicious. Please post back your results, thank you ! Miss Letizia, The focaccia was wonderful. I made it by your recipe,and was very pleased with the texture, both inside and out. I had to bake it longer that I expected, but it turned out fine. Do you know the history, or origin of Focaccia?? I would certainly like to hear, if you know. Thanks again, Kim and I loved it. P.S. We put the onions, ad some wonderful garlic stuffed olives on the bread, very nice! I made your yummy focaccia yesterday, and it was fabulous. It didn’t seem to have as much air in the final bread that it should though. What do you think I’m doing wrong? Not enough second time rise time after it goes in the baking pan maybe? lovely to know you have made the focaccia. Do you by any chance still have the package of flour you used? I would need to see the nutritional information and the ingredients list. Please send me a photo or post it on FB. It takes a few experiments to figure out which is the best flour for pizza. If it’s a very strong flour you might need to proof it for even longer than 24 hours. It is also possible that you need to make the dough more wet and that you had too much topping. A dry dough and too much topping are typical factors that prevent the formation of air bubbles. Did you set your oven at top temperature? how long did the pizza cook? Please let me know and i will try to advice. Ciao! Thank you for your reply.. I think I didn’t proof the original dough long enough. I made the dough around 9:00 AM, and then put in the pan for the 2nd proof around 5:00 PM that same day. So, I’ll try again soon, but this time make it one day and let it proof for a full 24 hrs till the next.. I’ll let you know how it comes out..
Love having you to talk to about your wonderful cookbook!! Hi Paula, I am so delighted you like the cookbook! If you have no time to proof, it’s better to add just a hint more yeast, e.g. 1/2 teaspoon rather than 1/4 teaspoon per pound flour. Best results are with longer proofing though!